Eyedog Cloud is our indoor navigation system that works fully in a web browser whether that is on a smartphone, tablet, desktop, laptop or kiosk. 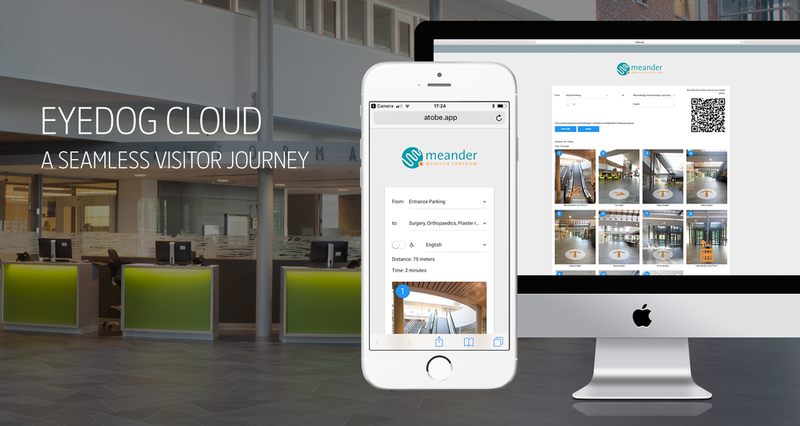 Eyedog Cloud is typically used where building visitors are not willing to download native apps for wayfinding because the visits are short and occasional like hospitals, offices, offices in universities, conference buildings, courts, lay-overs at airports, etc. In fact, this is suitable in any building that has use cases of people visting the facility occasionally and where visits have a strong timing component. Eyedog Cloud is the only turn by turn indoor navigation system that works in a browser. Map based indoor navigation systems in a browser are nothing more than indoor digital maps which won’t work for wayfinding in indoor spaces according scientific research. Eyedog Cloud routes are accessed by unique hyperlinks. These unique links to routes are available to any staff member on the Eyedog Cloud Wayfinding Portal for your organisation and let’s your staff create custom routes and share them with all your visitors. For example in digital patient appointment letters, SMS appointment reminders, in emails, in whatsapp messages, calender invites, in email signatures, etc, etc. Eyedog Cloud Wayfinding Portal is accessible from any desktop computer, laptop, iPad, but can also be integrated into website or wayfinding kiosks supporting self service. These web-apps offer a 'second screen' experience ensuring that route information can easily be transferred from unstaffed kiosks or staffed informtion deskts to the mobile screen of the visitor. No app downloads required: just load and go! It is very easy to integrate Eyedog Cloud with 3rd party software. Patient Portal apps can easily access Eyedog Cloud and offer customized wayfinding information to visitors through email, SMS, WhatsApp, etc.